Four killer tracks from the 80's CBS Kenya imprint! 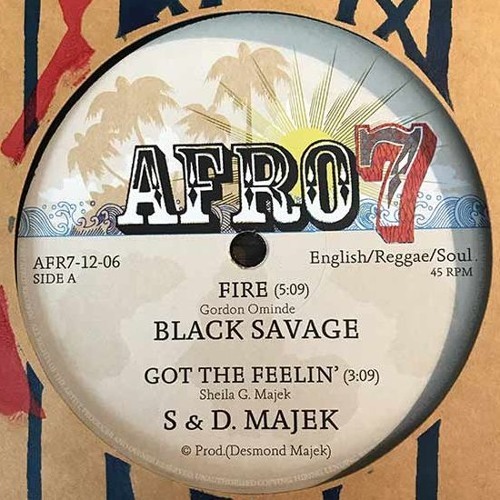 Afro7 is back and this time we’ve dug deep in the CBS Kenya vaults and found four fantastic soulful reggae tracks of early 80’s origin! First song is the bouncy 'FIRE' by Kenyan Black Savage Band (played out on the Worldwide show by Gilles Peterson back in the start of Summer 2018) Track two on the first side is Nigerian Sheila and Desmond Majek’s laidback soulful ‘GOT THE FEELIN’ and flip it for two fantastic tracks by the Kenya coastal outfit OVID, check out the synth drum machine laden 'KARIBUNI' and the party number 'OPERATOR'. Mastered by Frank The Carvery. EP comes in super deluxe cardboard jacket made in Thailand with silk screened coastal-inspired artwork made by California resident Steve Roden. Limited to 500 copies, one copy per customer.